Approximately 5 million U.S. patients with significant acne seek physician treatment, representing a target market exceeding $1 billion. 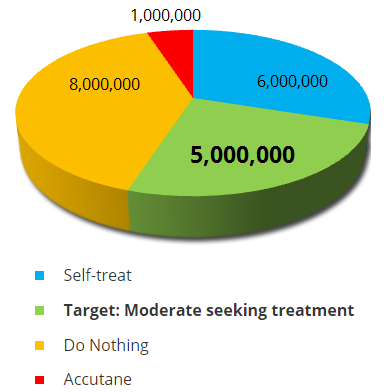 Over $3 billion is spent annually on prescription acne therapy. Efficacy of current treatments is decreasing as antibiotic resistance now exceeds 50%. The patient population is highly motivated with demonstrated willingness to self-pay for uninsured treatments.